Come and Celebrate Life, Love and Health with us – A lively and powerful team is gathering of International and Local; Facilitators, Teachers, Community Leaders, Practitioners, Healers, Creative Artists, Dancers, Music lovers and spirited humans. 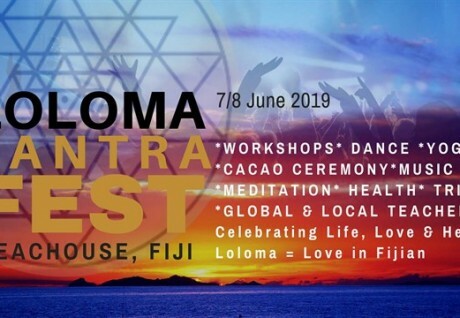 In the first ever Loloma Tantra Festival Fiji just before the first ever week long ISTA Level 1 SSSEx Training (see below for event link). Coming together to open your mind and heart to new possibilities for living, loving and health. This 2 night, 1 day festival will offer loads of workshops to give you experience and tools to relate to yourself, others and live life more fully, embodiment sessions – yoga, dance, meditation, non-religious ceremony, healing sessions, relationship and communication skills, conscious relating and tantric meditations all at the tropical beachfront paradise of The Beachouse…. Step into an open, caring community tribe of like-minded souls, where you can be yourself. Find more freedom, love and empowerment. Come play with us! • Ritual, Conscious Play and Music! We look forward to you joining this tribe of love and joy, freedom of expression and a community where creativity and full aliveness is inspired in every moment. We believe that every word should be a song and every step should be a dance, so join us is this creation of the Celebration of Life. Saturday 8am Day opens with workshops, healing space and embodiment sessions. Finishing the day with a conscious play party till 11.00pm. If you are interested in really diving deep to access your full Power, Freedom and Love then the ISTA Level 1 SSSEx 1 week retreat starting Monday 10 June may be your next step!